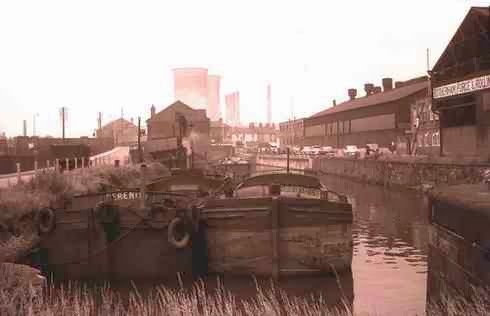 This is the third in a series of postings which will include some old photographs taken along the South Yorkshire Navigation. Today the navigation is used for leisure, however for many years it was an essential service for fledgling businesses during the early days of the industrial revolution. Eventually overtaken for speed and carrying capacity by the railways. The railways like the waterways has since shrunk over time. Starting with the privations brought about by the Beeching axe. Now the navigation only has a limited commercial use being mostly leisure with a historical perspective. That harks back to a far different era. 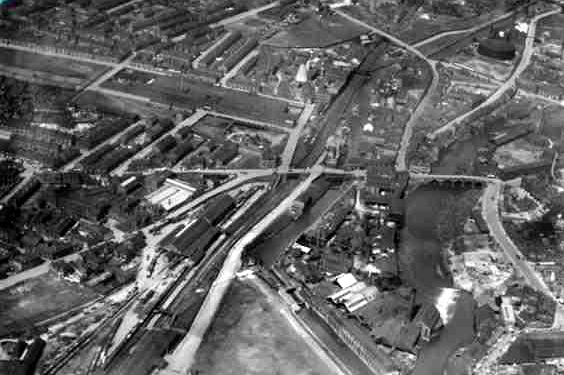 Rotherham town lock can be seen in this ariel photograph taken in the 1920's. The lock is located at the bottom centre The Great Central railway shadows the line of the canal on the left. With the river passing over the weir and under chantry bridge to the right. Rotherham Town Lock for many years had a fleet of small tipper trucks that brought coal to offload into the coal chute and slowly fill the barge hold. The barge crew would move the barge backwards and forwards to spread the load in the hold. Sometimes someone would go into the hold to spread the load with huge shovels that were used almost like paddles to spread the load and balance the boat. The coal barges and the timber barges were the only craft that never seemed to be sheeted. At the tail of the lock was a swing bridge carrying a railway line from the old Central Station into Rotherham Forge and Rolling Mills. Eastwood Lock is located in an area that was in the main coal mining and where small and large engineering businesses predominated. Joseph Foljambe's was perhaps the first factory where a plough was produced on a large scale. It was not until the 1760s that the plough came into general use outside of Rotherham. The plough measured from the end of either handle to the point of the share, 7 feet, 4 inches. Length of the beam, 6 feet. Length of the landside and share, as they run on the ground, 2 feet, 101 inches. Height from the ground to the top of the beam where the coulter goes through, 1 foot, 8 inches. Weight of wood and iron work, 140 lbs. There was a spirit of improvement between plough makers and it seems that in the 1770s all ploughs were made by local craftsmen. For over 30 years this design proved very popular and was used extensively up and down the country, as well as abroad. Aldwark Lock. The etymology of the name Aldwark is Saxon in origin and is derived from ald or 'old' and wark 'work or wharf'. There has been activity in the Aldwark area from Roman times. It is thought that the river Don was navigable for small boats as far as Aldwark. In the 1860s the first shaft for the Aldwarke Main Colliery was sunk. The mine was sunk in three stages, the first shaft reached the productive Barnsley seam (bed) in 1867. It took a further 10 years, by deepening the same shaft to reach the Parkgate bed but it was not until 1884, with the sinking of a second shaft, that the Silkstone seam was reached. The colliery continued taking production from these seams until the Second World War when, between 1944 and 1946, the shafts were deepened to reach the Swallow Wood seam and give better access to the Parkgate seam. However, the colliery closed in 1961 after almost a hundred years in operation. Now the whole area is almost totally covered by the massive Aldwarke Steel Works.